4 Bedroom Detached House For Sale in Somerton for Asking Price £750,000. Great Gane House is a detached property built in 1989 and has been in the same ownership since construction. Designed with a forward thinking approach, the property has been cleverly designed to provide flexible accommodation and with small changes, can offer annexe potential. The ground floor comprises; entrance porch, entrance hall, kitchen/breakfast room, sitting/ dining room, games room, study, downstairs WC, utility room, further WC, garden room, workshop and double garage. The first floor offers a spacious bright landing, three double bedrooms, family Jack and Jill bathroom, master bedroom with dressing room and his and hers en-suites. 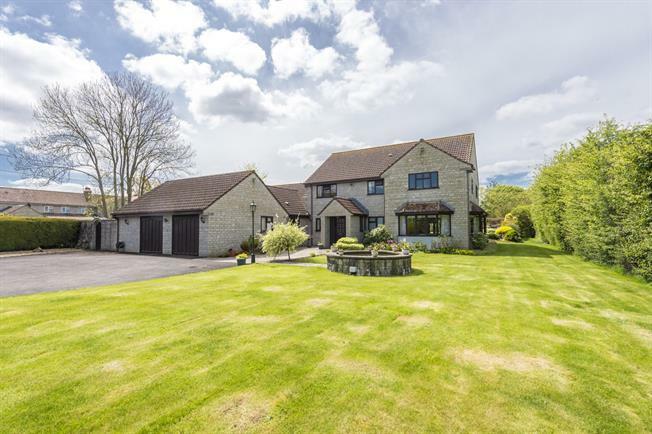 Positioned on a large plot, the property is surrounded by well kept gardens, provides ample driveway parking and enjoys open countryside views. Council tax band F (South Somerset District Council), gas central heating via radiators. New boiler fitted 1st October 2018. Double glazed windows and doors with solid wood frames. Air exchange system. Mains water (metered) and drainage. Water bore hole serves the gardens. West facing rear garden.